This book is a homage to freedom fighters, revolutionaries and patriots such as Bhagat Singh, Khudiram Bose and Ashfaqulla Khan who strode to the gallows, their heads held high, with smiles on their faces. Categories: History, Politics, Sociology and Anthropology. Tags: 9788170175476, Ashfaqulla Khan, Bhagat Singh, Bhagavad Gita, Gandhi, Indian freedom fighters, Indian independence, Indian revolutionaries, Jawaharlal Nehru, Jinnah, Khudiram Bose. The British annexation of the south Asian subcontinent was violently opposed from the very beginning. Under the Crown, however, when the Raj administration tightened its grip, a number of secret revolutionary groups sprang up. These societies attracted idealistic young men who eagerly laid down their lives for their country. Many of them were motivated by their seniors who sought sanction for violence from the holiest text of the Hindus, the Bhagavad Gita. 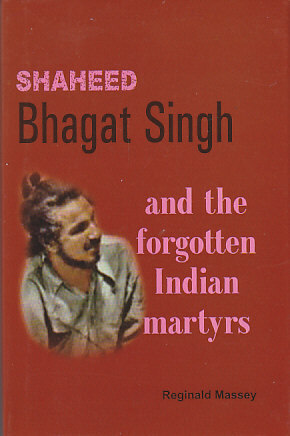 However, some of the patriots, such as Bhagat Singh, were confirmed atheists, influenced by Marx, Lenin and the Anarchists. These young Indians were shunned and condemned by the three London educated barristers, Gandhi, Jinnah and Nehru. With the assassination of Gandhi a few months after Indian independnce, and the death of Jinnah a year after the creation of Pakistan, the main beneficiary of the trio was the Harrow educated Jawaharlal Nehru. Nehru and his government were not eager to celebrate executed assassins. Over the years, and with the emergence of a new India firmly within the ambit of the western capitalist system, the young men who were tortured and hanged have been largely forgotten. But in the annals of Indian history, they and their comrades will always be Shaheeds, martyrs. Reginald Massey has written books on India on a variety of subjects ranging from history, culture and travel to classical music and dance. Azaadi!, his selection of short stories chronicles South Asia after 1947. His book of verse Lament of a Lost Hero and Other Poems comments on subcontinental society in the post-independence period. South Asia: Definitions and Clarifications sweeps away several religious, cultural, social and historical cobwebs.